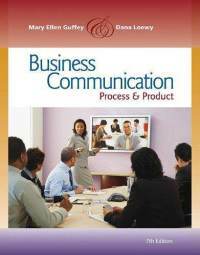 BUSINESS COMMUNICATION: PROCESS AND PRODUCT, 7 is designed to prepare students for success in today's digital workplace as well as tips on job searching skills. The textbook and accompanying Web site explains the basics of communicating in the workplace, working in teams, how to being a good listener and understanding business etiquette. Students study and practice the skills and activities involved in the writing process including the appropriate use of social media, preparing formal reports and proposals as well as informal business reports. The appendixes guide students through grammar and writing mechanics as well as information on formatting and writing documents. Authors Mary Ellen Guffey and Dana Loewy offer a wealth of ideas for writing resumes and cover letters, participating in interviews, and completing follow-up activities.